Section 7.3 of the CHEM 1001 text: Chemistry Concepts and Connections by Corwin introduces the topic of a Polyatomic ion. The College Chemistry text: General Chemistry by Zumdahl also introduces Polyatomic ions in Section 2.8. The PHSC 1001 text: Physical Science by Tillery, introduces polyatomic ions in chapter 9 and has a list of some ions in Table 9.3 on page 238. Each text provides a list of common Polyatomic ions: Corwin Table 7.3. Almost all chemistry textbooks have sections dedicated to polyatomic ions and include a list of common ions, Corwin suggests that you use flash cards listing the name on one side and the formula with its charge on the other to aide your memorization of these formulas. Most chemistry teachers require you to know some of the common polyatomic ions by the end of the course whether its be from repetition of use with a help table or from memory from the day of introduction. On the attached pages are copies of the tables from the two texts: Table 7.3 from Corwin and Table 2.4 from Hill & Petrucci. Polyatomic ions are not molecules. Most are nonmetals bonded covalently to oxygen and have negative overall charge. 1. Take the exploded nonmetal section of the periodic chart and draw the electron dot structures of the atoms. 2. Take the exploded nonmetal section of the periodic chart and draw the electron dot structure of the ion represented by the -ide suffix added to element's stem name. 4. Take the polyatomic ion section of the periodic chart, copy the formula and the charge in each square from a polyatom ion table from the chemistry textbooks or from the Internet. 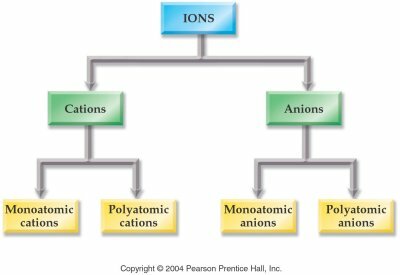 How many oxygens are on each ion and what is the charge oin each ion? Place the nonmetal which is not oxygen or hydrogen in the middle of your desk. First using all single bonds, hook all oxygens in the formula to the central nonmetal (Simple covalent or coordinate covalent bonds). Never hook oxygen to oxygen except in peroxides. If oxygen is present, hook the hydrogen written first in the chemical formula to an oxygen. Hydrogen requires only two electrons to fill it's orbital. Notice the change in the polyion's charge when a hydrogen is placed on the oxygen. If hydrogen is written second in the formula after another nonmetal, then hook that hydrogen to that nonmetal, not to oxygen such as (CH3-COOH writen organically) acetic acid HC2H3O2 or oxalic acid H2C2O4 both hydrogens are attached to the oxygens. If using all single bonds connecting the oxygen to the central nonmetal, the count of electron around each element should total eight electrons (octet rule). This includes the element's original outer surface (valence) electrons plus the electrons being shared from the bonded element. If the count is 7-7, then add a second bond, a double covalent bond (four electrons being shared between two atoms. If the count is 6-6, then make a triple covalent bond between the two elements (six electrons shared between the two atoms). 1. carbonate(no Plug in) ToolBook Demo caronate and molecules (Neuron Plug in Needed). If the count is 8-6, then make a coordinate covalent bond. Hook the six (vacant) orbital onto an unshared pair of the eight. A coordinate covalent bond is still a single bond. In making double, triple bonds you may use one or two coordinate covalent bonds to predict a structure using the octet rule. Dot Structures of Polyatomic ions plotted on exploded nonmetal section of periodic table. Note the doubles bonds in nitrate, carbonate, and silicate. -ate polyatom ions have three oxygen in the formula if across the top of the periodic chart and down group 17 (VIIA). Inside the inverted L is a box of four where the -ate polyatom ion has four oxygens in the formula. The charge on the -ate polyatomic ion is exactly the same as the nonoxygen central nonmetal's -ide monoatomic ion if all the oxygens are attached by single covalent bonds (simple covalent or coordinate covalent). Nitrogen, Carbon, and Silicon -ate ions have charges +2 more than the -ide predicted form of N3 -, C4 - (theorical), and Si4 -(theorical-there are no -4 ions) because the ion is more stable with a double covalent bond than all single bonds (three or four electron inbalance between the protons and the electrons). Adding a hydrogen to the oxygen in a polyatomic ion, increases the overall charge of the polyatomic ion by 1+. The polyatomic ions containing one less oxygen atom then the -ate formula has the name similiar to STEM + -ate. The -ate suffix is changed to -ite. Note all the -ite polyatomic ions have the same charge as the -ate parent ion, but one less oxygen atom. 1. Suppose there is one more oxygen than the -ate formula, what is its name? 2. Suppose there is one less oxygen than the -ite formula, what is the name?